One of the most respected profession is that of a doctor. People respect and have complete faith in doctors whenever they are facing dreadful situations in their lives. If you have the urge to become a doctor and save people’s lives, then you need to have dedication and should be capable of doing hard work. Here are few interview questions to ask a doctor about their job. 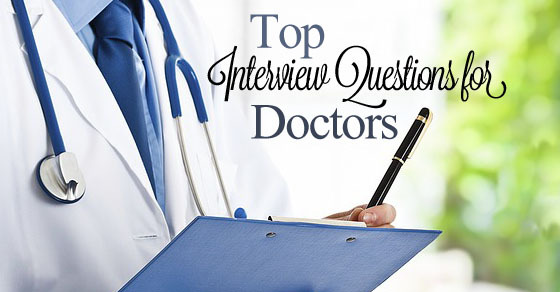 The following mentioned are few most common interview questions for doctors along with its answers. 1. Why did you choose to become a doctor? Since medical practice is such a respected profession, the first and the top interview question that is asked is why did you choose to become a doctor. Firstly, you should be able to give satisfactory question to the interviewer. You shall explain, that you respect human life and would like to dedicate your life in serving them. You want to save people from suffering both mentally and physically. 2. Why you have chosen this field of specialty? In the profession of doctors there are many specialties. So, why there is any field of specialty to a doctor. For example, if any doctor is a gynecologist, then you shall be able to explain that you always welcome new life in the world. Also, you would like to get detailed knowledge of various problems that a woman has to suffer. You would like to find out the solution to these problems through research. 3. What is your professional experience as a doctor? Another important job interview question that is commonly asked to the doctor is about their qualification. To become a doctor you have to go through a tough process of studies. You should try to get admission in medical colleges. You shall be able to give a detailed explanation of your degrees. Also, you should give details about any field if you have done specialization in. 4. What are the unique and different skills you have, as a doctor? Every doctor has their own special way of treating the patients. You should be able to satisfy the interviewer with the special skills that you have. Say, as a doctor when there is a sick person who visits you, then you after diagnosing the patient give the list of prescribed tests and only then you give the required medicines. You shall explain the interviewers that prescribing medicines without any test is not your way of treating the patients. 5. Why this hospital or medical department interests you? As a doctor it is your duty to do the best for your patients. You should explain them this hospital is the best in its field and just like you, there aim is also to serve the people. Also, this hospital is equipped with latest medical equipments. The team of doctors in their hospital is one of the best in the city. 6. What is your planning about the future? If you are a doctor then you always dream of something big in your lifetime. You should explain the interviewer about your future plans of opening a hospital in the country with all the latest medical equipments from all around the world. Also, how you are going to invest your entire plan, whether through loans or any other backup that you have. For answering such medical interview question, you should explain the interviewer that, in case there is a medical emergency in the hospital your first step will be to save the patient rather than getting engaged in the formalities. As a doctor you know your duties and will try your best in doing them. You will try to arrange all the specialists if required. Informing the police after taking care of the patients will be your duty. 8. What is your routine on a daily basis? You should tell the interviewer about your daily work routine. The number of hours that you spend at your clinic or any private hospital where you are appointed. The number of patients that you check on a regular basis. In case you are a surgeon, then number of patients that you operate on a daily basis. If you visit your patients at home, then the number of visits that you make on a daily basis. 9. Do you as a doctor have any weakness or strength? All of us have some weakness or strength and same goes to the doctors too. You should never hide your weakness, if any, from the interviewer. Say if you can do all your duties well, but it will be difficult for you to be available for night shifts due to same personal problems. Also, any strength can act as a benefit for you. Like you are a cardiologist, but you can also perform surgery in case of an emergency. In this way you can save the life of a patient. 10. What are your achievements till date? You should never hide about your achievements from the interview panel. List down all the awards that you have achieved for your hard work. If there are scholarships that you have won, then list them down in your award list. Never forget to list the seminars and conferences that you have attended. Any workshops that you have conducted for the betterment of your patients. If you are a member of a faculty in any of the medical institutes or called for taking lectures, listing all these will highlight your achievements and will show the interviewer your dedication about the work. 11. What is your ability to face the challenges both medical and personal? As a doctor you have to face many challenges daily. So, you must highlight your ability to tackle these challenges very carefully and intelligently rather than getting hyper. Dealing with challenges faced by a doctor, if not handled properly can lead to death of the patient. Show your power, making decisions in situations of emergency rather than losing control. 12. Why any hospital should hire you in their institution? For any hospital hiring a good team of doctors is very important. Every hospital wants to render good services to its patients so that they feel safe and secure. You should ensure that you will best support the policies of the hospital and will take care of the patients to your best capability. Your main motive will be to save the patient and at the same time take care of the goodwill of the hospital. 13. Do you as a doctor have any preferences? Any hospital while hiring a doctor would like to ensure that the doctor they are hiring is best suited to their hospital. In such a case the hospital will ask for any reference that you have so that they can get the required inquiry done. By doing this they will be satisfied about the facts you have told them. 14. Will you work at the salary we are offering you? One of the most important aspect of a job is the salary offered to you. If the job offered to you is in one of the respectable hospitals of the country, then you shall not consider salary as a major aspect in your career. You shall make advisor believe that it is the hospital that you want to get associated with rather than the money. The aim that the hospital holds for itself is the same for you as well. 15. Do you have any knowledge about our hospital? This type of hospital interview questions are commonly asked by the interviewer to know that, do you have any idea about the rules and regulations of the hospital. For this you should be well prepared about the history of the hospital. Along with this you should also do a detailed study of the various policies of the hospital. The terms and conditions of the hospital should be clear to you before applying for the job. 16. How did you get to know about the position of doctor we are offering to you? This is a tricky question that can trap you because sometimes if you do not want to mention the name of the person who told you about the job then that may not work well for the interview panel. You should be ready with your answer to this question. You can act a little smart by saying that you always wanted to work in this hospital and so you follow the job scenario here very carefully. 17. Is this your dream job? All the doctors in their entire life dream of becoming a member of a reputed hospital where they can save people from dying. To answer this question you shall highlight the achievements of the hospital and the way this hospital is serving the people. You should always acknowledge this job as your dream job because only then the interviewer can trust you and will hire you in the hospital. 18. Are there other hospitals you want to seek jobs with? For this medicine interview question, you shall tell the interviewer that you have applied in other hospitals as well, but your first preference will be this hospital. Other hospitals that you have applied in are also good, but this hospital is the best. 19. Is your current job satisfactory enough, then why are you leaving it? You should answer to this question after a thought. You shall always give a valid reason for this question. The reason you give to this question should satisfy the interviewer. 20. Will you travel if job demands? In case of medical emergencies, various hospitals call doctors to treat the patients. So, if you are ready to travel when called even to distant places to treat the patients then you should mention it, while you are in the interview. This will help the hospital to develop goodwill and will add to its advantage in various other ways. 21. Do you have any knowledge about the hospitals in our area? The interviewers are keen to know what knowledge you have about their rival hospitals in the same area. These days hospitals also need to earn profits because they have employees who need to be paid. So, before going for an interview you should do a little research about the local hospitals and the various doctors who visit them. Also, the various types of facilities these hospitals provide to their patients should be acknowledged. 22. How can you contribute to our hospital? You should show that you will do your best to treat the patients and to build and maintain the goodwill of the hospital. People place their trust in doctors and you will try to become their guide in case of need. You will not do anything which can harm your patients or spoil the goodwill of the hospital. 23. When was the last time you were head of a medical team? For this question you should give all the details of the last project that you handled. You should also highlight your achievements in this project and the results that you have reached. It was because of your dedication towards work and your willingness to serve the patients that you were selected as the team head. Whenever you are going to appear for an doctor interview be confident and don’t let interviewers over power you. To become a doctor you have always worked very hard and you should take pride in that. You should take pride in your achievements and always make them a highlight of your resume. But, never forget the sole motive of a doctor is to treat the patients to their best capabilities and to save their life in case of emergencies. So, just go for that interview and get that job. Make both, your patients and hospital proud of you.